We present the development of a low-cost Unmanned Aerial Vehicle-Light Detecting and Ranging (UAV-LiDAR) system and an accompanying workflow to produce 3D point clouds. UAV systems provide an unrivalled combination of high temporal and spatial resolution datasets. The TerraLuma UAV-LiDAR system has been developed to take advantage of these properties and in doing so overcome some of the current limitations of the use of this technology within the forestry industry. A modified processing workflow including a novel trajectory determination algorithm fusing observations from a GPS receiver, an Inertial Measurement Unit (IMU) and a High Definition (HD) video camera is presented. The advantages of this workflow are demonstrated using a rigorous assessment of the spatial accuracy of the final point clouds. It is shown that due to the inclusion of video the horizontal accuracy of the final point cloud improves from 0.61 m to 0.34 m (RMS error assessed against ground control). 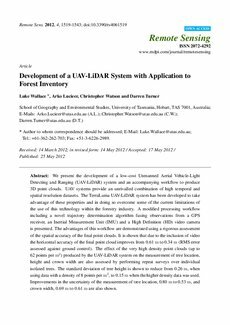 The effect of the very high density point clouds (up to 62 points per m2) produced by the UAV-LiDAR system on the measurement of tree location, height and crown width are also assessed by performing repeat surveys over individual isolated trees. The standard deviation of tree height is shown to reduce from 0.26 m, when using data with a density of 8 points perm2, to 0.15mwhen the higher density data was used. Improvements in the uncertainty of the measurement of tree location, 0.80 m to 0.53 m, and crown width, 0.69 m to 0.61 m are also shown.